About a year and a half ago I started a series where I showed you what I got in my graze box and what I thought of it, unfortunately life got in the way and I just completely forgot to continue the series until now. 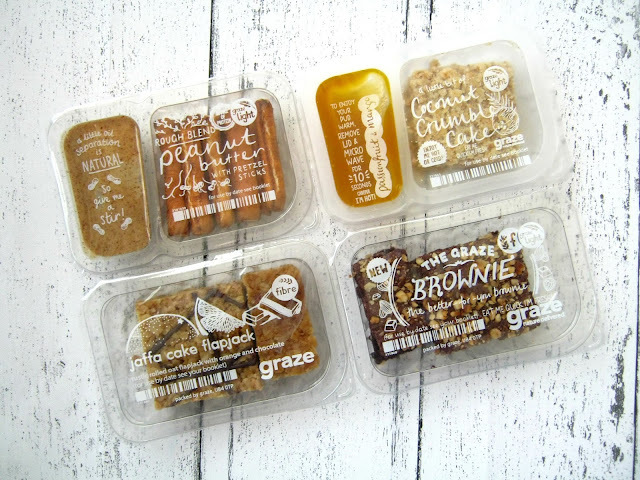 I've been a big fan of Graze for a few years now and for someone like myself who struggles to find healthy snacks that are also yummy they really are a fab subscription box. Recently I got an exciting email from graze, they'd asked me to be an ambassador for them and since they are a brand that I truly do love I said yes straight away. I can't wait to posting about them lots more on my blog so look out for a few food posts coming up! Today's box that I'm talking about was very kindly to sent to me by the team at graze as a little welcome. Firstly can we all just take a moment to appreciate the very festive box that my snacks came in! 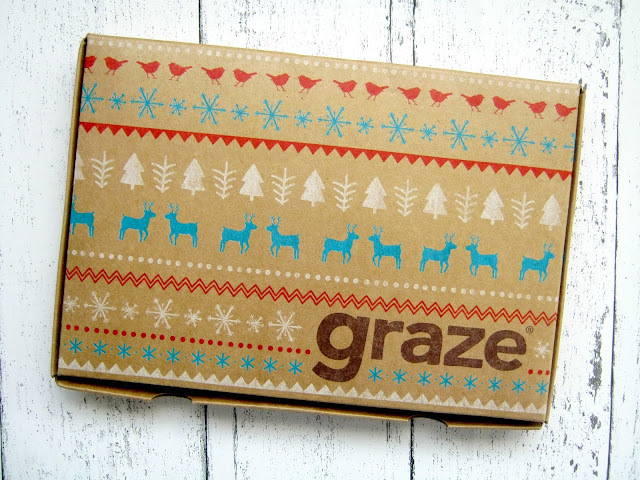 Not too much has changed since I last got a graze box but the added extra festive design is one new things that I love. One of the biggest changes that has happened since graze first started though is that finally you can now order one off boxes, you no longer have to commit to a subscription which is perfect for me as I would rather just order boxes when I fancy them. This box is the classic variety box (£3.89) which comes with 4 different snacks based on your likes and dislikes which you can change on the website whenever you like. When I first opened the box my eyes definitely locked on to this snack the quickest, I love peanut butter and will have it with most things but I'd never paired it with pretzels before so I quickly tucked into it to find out what it was like. Honestly this has to be one of the best flavour blends I've ever tried, the peanut butter tastes amazing but also really natural and healthy and the pretzel sticks compliment it well. I ticked love on this snack very quickly after devouring my box! Again graze got it so right when picking this snack for my box, I adore anything coconut flavoured and of course I love cake so it seemed like the perfect combination. The cake itself was really nice and just the right size to get rid of that sweet treat craving but I wasn't too sure about the passionfruit and mango topping if I'm honest. I think it would go well with other things, maybe in a yoghurt, but I just didn't enjoy it over the cake. I'd say this is the only snack out of the box that I didn't enjoy too much, 3 out of 4 isn't bad though is it? I'm not a fan of things that are orange flavoured so it didn't surprise me that I didn't enjoy it, my Mum loved it though! It's not a huge deal though as I can just change this snack to bin on my graze profile and I won't get sent it again which I think is one of the best things about graze, it really is so personalised. I thought I'd talk about this last and finish on a high, this is definitely my favourite snack out of the bunch! Honestly if I could I'd buy this brownie in bulk I would, it is really light yet super chocolatey and filling. The best thing about it has to be that it is tons better for you than the brownies you can buy from bakeries or supermarkets, yes it isn't as good as eating a piece of fruit but it is definitely a guilt free treat! Overall I was super happy with what I received in this box and I'm tempted now to get one of their chocolate boxes to try out some of the other sweet treats that they offer. I love that the range has expanded so much since I last ordered a box and I'm looking forward to trying some of it out! 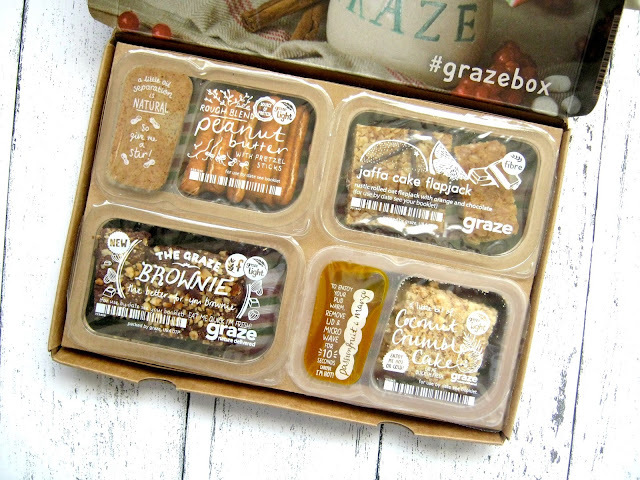 If you haven't tried graze yet and want to then use the code SHONAC1HB to get your 1st, 5th and 10th box free! I absolutely love graze boxes! My favourites are the cheese cashews they are delicious. I used to get Graze all the time but sadly I don't like nuts so it was basically just me and some flapjack most weeks! I'd love to pick them up again at some point: I also find it very difficult to find healthy snacks that aren't just big lumps of chocolate. I also love their festive boxes and the Easter one was always so lovely. I used to get Graze boxes but when I moved I cancelled them and just never remembered to re-start my orders! I miss them though!